This week I had a little shuffle around of the recipes that were left on my list and switched out a couple I knew I wasn't going to be able to try before the end of the challenge. After doing so, I got ill and had to make another switch or two... but I'm still determined to finish the challenge! If you missed the previous post in this series you can catch up here. I first saw this recipe over on Lazy Vegan and couldn't resist adding it to the challenge. I've tried out a lot of dairy free cheeses over the last few months, including one previous attempt at making my own, but this cashew-based one - originally created by Veged Out - was so easy to make and tasted really good. I added it to the top of a lentil pasta bake but I think it would also be great for lasagne, pizza and even paired with pesto for a cheese toastie! For day 18 I had planned to test out my faux mozzarella cheese on a pizza recipe however things didn't quite work out. In need of an alternative I created this dish inspired by a pasta bake I'd seen on the BBC Good Food website. I switched out the rigatoni for carrots & red pepper, used vegan sausages then topped with some of the 'moxarella' before baking. It actually turned out to be pretty tasty and is definitely something I would make again. When choosing potential recipes for the challenge this simple pesto pasta from Blissful Basil was the first one I picked out! This roasted broccoli pesto with basil and pumpkin seeds was really easy to make and would be a perfect for a lazy day when you don't feel like spending too long in the kitchen. 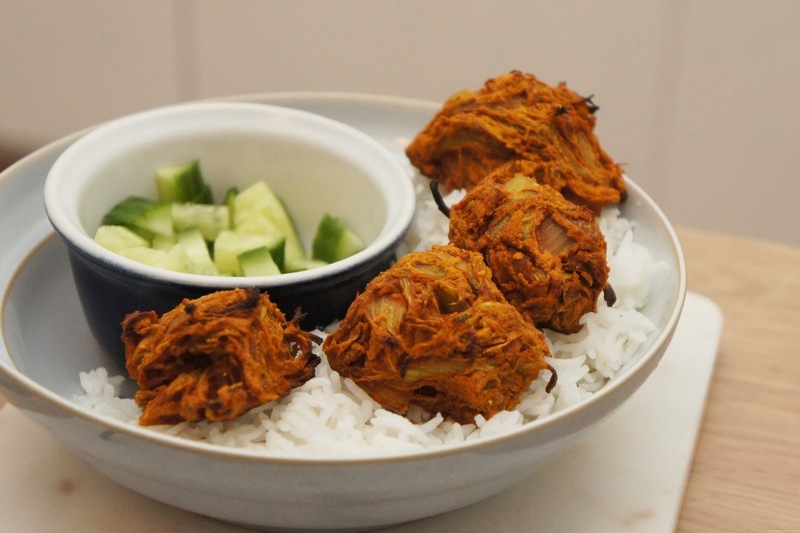 At home when we make onion bhajis we usually opt for a fried version from A Saucy Kitchen but I thought it might be nice to also try out a baked alternative that could pair well with the rice paper samosas I made back on day 10 of the challenge. These baked bhajis based on a recipe from Harriet Emily were easy to make and had tons of flavour! Originally I have planned to try out a different recipe on day 21 but feeling ill meant that I definitely didn't feel up to standing in the kitchen for too long so I opted to try out this quick one pot pasta from Trial & Eater instead. The combination of mushrooms, tomato and spinach was simple yet delicious - the type of recipe to learn by heart for when you want a quick and tasty meal!